Posted May 30, 2017 under Ask Us. Most people get headaches once in a while but it’s not normal to have a headache every day. Make an appointment with your primary care provider to get checked. In the meantime it’s a good idea to keep a diary of your headaches. Write down when you notice them, if anything seems to bring them on, the location of the pain (ex. forehead, back of head), how long they last, whether they are throbbing, time of day (for example, after school, middle of the night waking you from sleep), nausea or vomiting, and if you take any medicine for them such as ibuprofen, family history of headaches, etc. 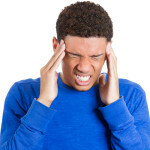 There are many different kinds of headaches including tension headaches and migraine headaches. Many times headaches can be caused by a “trigger” (something specific that activates the headache such as skipping meals, getting too much sleep or not enough sleep, being dehydrated, and/or stressed). Headaches can very rarely be caused by a serious condition such as high blood pressure or a tumor. Your health care provider will listen to your story and may suggest that you try to avoid triggers, lower your stress level, exercise, and avoid daily ibuprofen.